The JOBE ARCHER plastic gold pan is the "cats meow" in gold pans for beginners or the most experienced panner. The black and green colors are both perfect for highlighting gold and black sand. 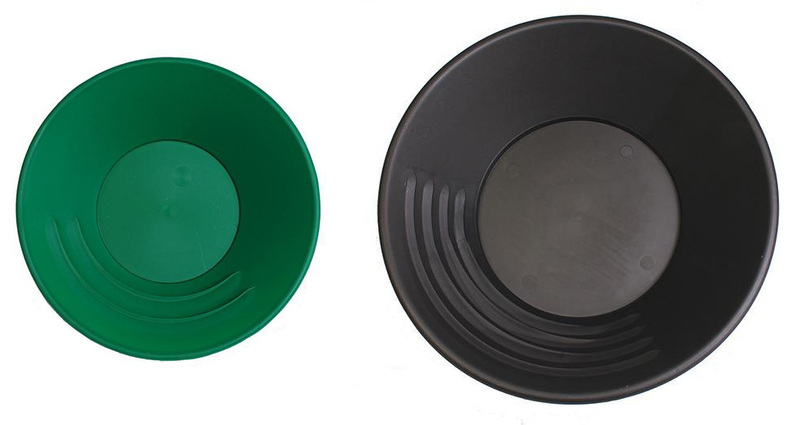 This pan is designed to be a very good general purpose gold pan and a perfect clean up pan. It sports two deep, sharp-edged riffles that are tapered to be deepest at the center of the pan. This has the effect of moving the gold to the center of the riffle area and securely trapping it. The small 1/8th inch drop at the bottom of the pan serves as a perfect mini-riffle for the final stages of clean up. Choose your color and either 10 or 14 inch from the drop down menu.